Heavy rain deepened the flood misery in farming and mountainous regions of northern Philippines today, after the latest typhoon to hit the storm-ravaged nation killed at least 22 people. Koppu had weakened into a tropical storm and moved into the South China Sea by today morning, but its huge rain band ensured downpours across swathes of the sodden north where tens of thousands of people were displaced. "The waters rose really fast, luckily we were rescued," Lourdes Gatmaitan, 64, told AFP after sleeping at a basketball court being used as an evacuation centre in Cabanatuan, a town about three hours' drive north of Manila, the capital. Koppu, the second strongest storm to hit Philippines this year, had impacted nearly 3,00,000 people across the main island of Luzon, the government's disaster management agency said. Twenty-two people were killed in floods, landslides and boat accidents, as well as by flying debris, according to an AFP tally based on confirmed figures from national and local authorities. Floods as high as rooftops had covered some of the nation's most important rice and corn farming regions in the flat plains north of Manila that are on either side of a giant mountain range. While the water had subsided by Tuesday in areas closer to the ranges, such as in Cabanatuan, the flooding had moved downstream to other farming towns. More than 200 villages in the farming regions were flooded today, with some areas more than one metre (three feet) under water, according to a report from the local civil defence office. And heavy rain continued over the Cordillera mountain range, meaning more water was expected to flow down. Weather forecasters also warned that Koppu would cut back onto the far northern edge of Luzon on Wednesday morning after picking up more water in the South China Sea. 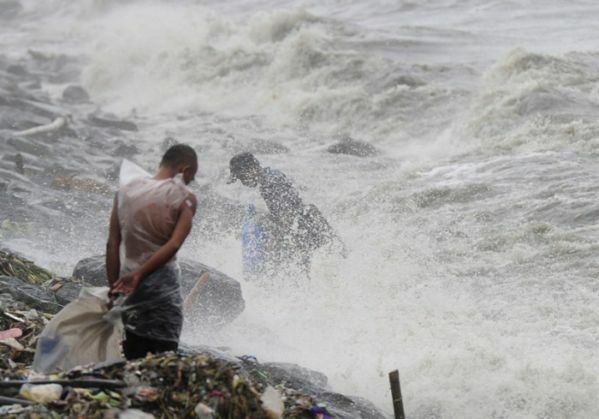 The Philippines endures about 20 major storms a year, many of them deadly.